Mullica Hill is a town in New Jersey, just a twenty minute car ride from Chester, Pennsylvania, on the Delaware River. Every summer, our family would drive through the town on the way to Cape May, our seashore destination. Farmland surrounds the village, and we would stop at one of the many roadside stands selling garden produce, always picking up fresh tomatoes and corn. To this day, nothing matches the flavor of Jersey vegetables. Our rush to get to the shore meant forgoing a visit to the town, always intending to stop because of the appeal of the charming clapboard buildings that lined both sides of the street. Antique and collectible stores occupied several of the buildings, some of which dated back to the 18th century. I admired the decorated store fronts, festooned with flowers while eclectic items spilled out of the shops. About 25 years ago, the village was placed on the National Register of Historic Places and the New Jersey State Register of Historic Places in recognition of the town’s historic and architectural significance. 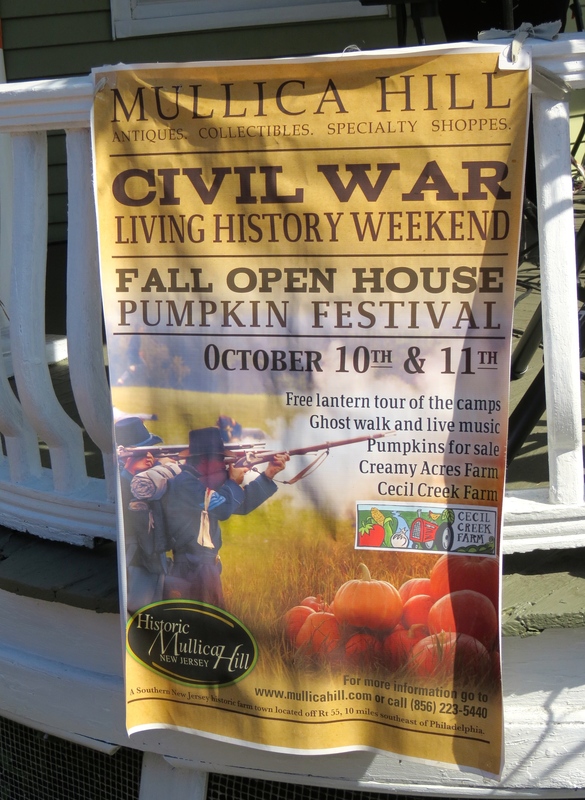 The second weekend in October Mullica Hill hosted a pumpkin festival and Civil War reenactment, so on a warm autumn morning, I drove through the countryside to finally visit the town. Stores displayed Fall motives with pumpkin and squash displays. I found places to eat such as Amelia’s Teas and Holly, The Canteen and the Blue Plate, which offers “Farms to Fork” with a listing of local farms from which they buy their ingredients. Musicians played from a porch on the main street, adding to the festive atmosphere. Mullica Hill claims a connection to the Civil War through native son, Samuel Gibbs French (1818-1910), author and Confederate General. He owned a plantation in Mississippi when he was appointed brigadier general of the army of the Confederate States. Gibbs wrote about his war experiences in his book, Two Wars. In addition filming the Civil War reenactment battle, I strolled around the camps, taking in the aroma of camp fires. Reenactors shared their knowledge of guns and cannons as well as other artifacts from the era. I stopped to listen to music performed by 26th Mifflin Guard band. 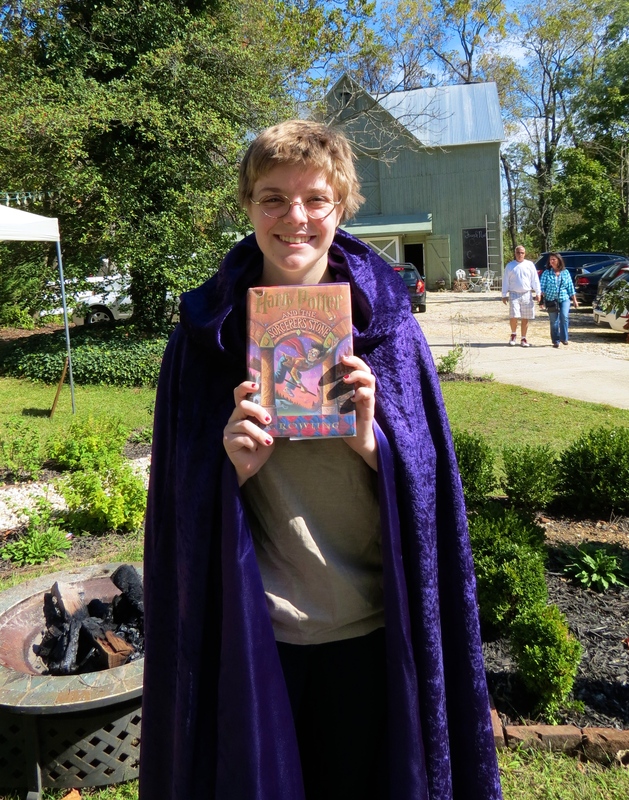 Returning to Mullica Hill was special, as I had friends who were participating in the living history demonstrations and could share a moment with them. Perhaps this was the time I was meant to be there. Kae, You have done a beautiful job, as usual. Thanks for coming and sharing with everyone. General John and Ms. Lynne Houck. I don’t remember Mullica Hill specifically, but this post brings back wonderful memories of driving across New Jersey to go to the seashore when I was a child. I can remember the many roadside stands. I think that we drove on the Black Horse Pike (or maybe it was the White Horse Pike). I remember being fascinated by the road name at the time.